Participants experienced village life and wealth of its heart with smile of local mothers who told us life in the bitter winter. 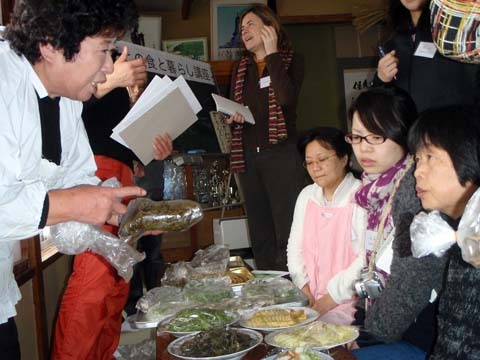 On January 16th, 2010, Winter preservative food workshop was held in Tochikubo, Minamiuonuma-city, Nigata. 11 people from Tokyo, Nagano, and Minami-uonuma including a German family participated in the workshop. They learned and experienced winter preservative food taught by local mothers, FUEKI Imiko, FUEKI Kiyoko, and KUWABARA Ayako. Local mothers are Introducing ingredients of preservative food. After self-introduction, local mothers explained Tochikubo winter life in the past when they married. There were no roads for cars, and winter was their bitter memory. As it was not easy to go shopping food, they preserved wild vegetables and crops from the field by drying and soaking in salt until Spring. Today, although they drive and go shopping in winter, local mothers use preservative wild vegetables and crops. Participants were surprised at the variety of preservative foods and their colors. Participants are trying a dry-preservative technique by weaving straw and hanging vegetables. 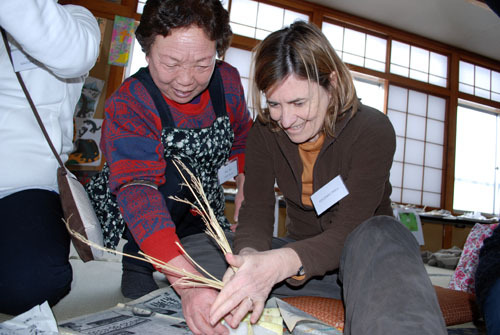 In the afternoon, participants visited FUEKI Kiyokos house, see vegetables and pickles preserved and stored in her garage, and learned the drying technique with straw of preservative vegetables. Participants asked questions such as cooking methods and tips for wild vegetables. Local mothers pointed that nice air and comfortable community relationship are the good parts of Tochikubo living. Though they though they came to a sever place for few years after their marriage, once you live in a place, it grows on you. They think Tochikubo is a nice place now. they mentioned. Participants enjoyed lunch using preservative food. Even people from near by town and village said there are not many chances to have this variety of wild vegetables and they wish to have a shop providing such preservative foods. Participants commented in their feedback as follows. *I often throw out foods. But, I would like to use preservative foods based on what I learned today. *Smile of local mothers was very impressive. *I felt that Tochikubo has rich community relationship although they do not have many things. Due to heavy snow, the local train was not running and the workshop began 40 minute late. But, mothers laughed and said that participants have experienced real Tochikubo life!